With the 2019 Presidential Elections now around the corner, the race to the top is heating up. Both camps have presented their credentials. Now they go deeper into their economic platform; openness to foreign investments; key challenges facing the nation!! A light breakfast will be served before the talk starting 08.30am to allow the business community to network. 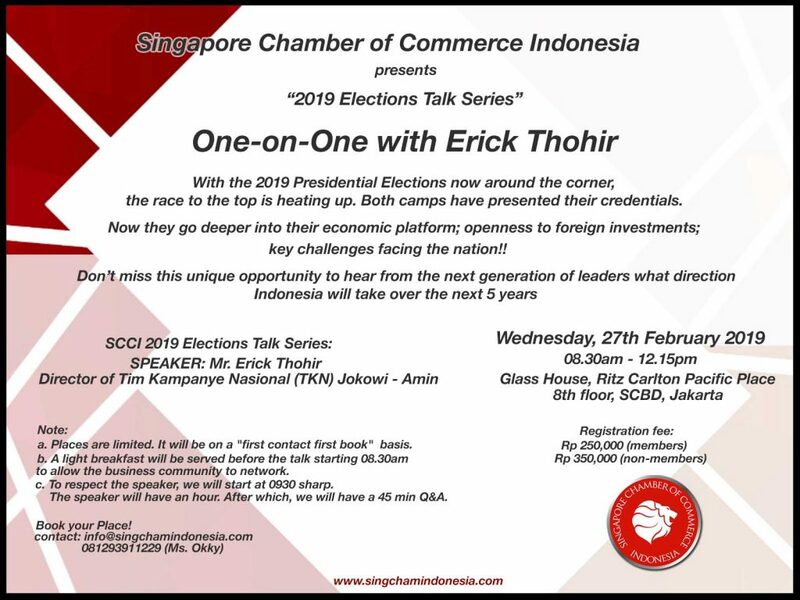 Please contact info@singchamindonesia.com / 081293911229 (Ms. Okky) to reserve a place at this exciting event. a. Places are limited. It will be on a “first contact first book” basis. b. Light breakfast will be served at 08.30am to allow the business community to network. b. To respect the speaker, we will start at 0930 sharp. The speaker will have an hour. After which, we will have a 45 min Q&A.